The Executive edition looks most like a classic wristwatch. After what seems like a decade of waiting we finally have a gadget fiend's Bluetooth wristwatch that looks like something normal people might consider wearing. The latest timepiece from the Sony Ericsson stable combines classic looks with some genuinely useful technology. 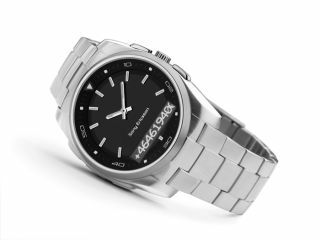 The MBW-150 was designed with specialist watchmaker Fossil, so looks less like a transformer robot than previous Sony Ericsson solo efforts, but it's what's under the surface that will have tech fans drooling when it arrives this autumn. Using Bluetooth to link to a compatible mobile phone, the MBW-150 is capable of vibrating when a call or text comes in to that phone as long as it's within 10m. Go out of range and the watch vibrates to warn you against forgetting the phone. Better still, a tiny OLED screen at the bottom of the watch face displays the caller ID, so there's no need to locate and answer the phone if it's an unwanted call. Should you take the call, it can be handled either by picking the phone up or through a Bluetooth headset. Naturally - given the Sony part of the partnership - music plays a part too. The MBW-150 can function as a Bluetooth remote and handle tunes stored on the phone. Aside from the usual music controls, song information pops up on the OLED as well. Three different styles are available - the Music, Executive and Classic editions, each aimed at different 'lifestyle' groups. At 182g, the Executive is by far the heaviest, so we reckon it's the most likely to succeed and, in doing so, may even rejuvenate a watch market crumbling under the weight of hundreds of millions of time-telling mobile phones. As for pricing, the only mark we have is a US price of $400 (£202), so we can expect to pay at least £300 when the MBW-150 hits the UK towards the end of this year.